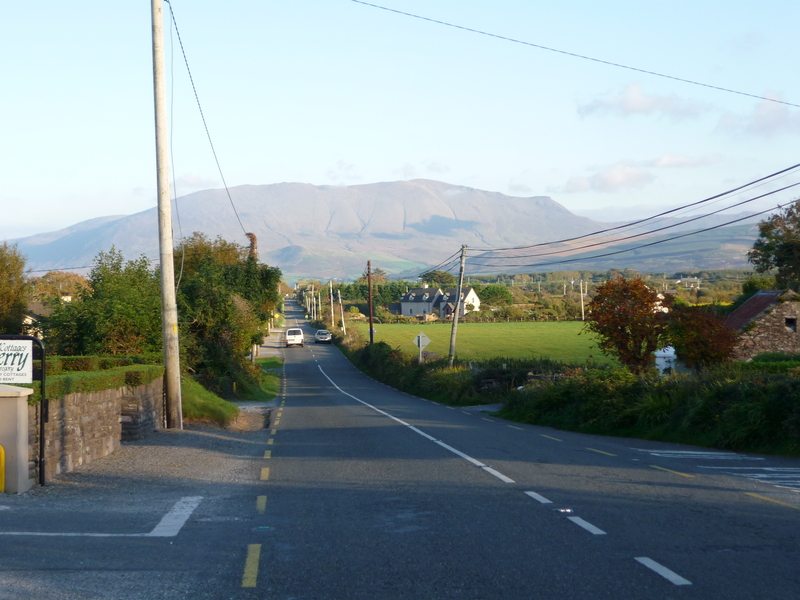 There are two ways of travelling from Dingle to Tralee by road. There’s the N86 which commercial vehicles and commuters use. And then there’s the Connor Pass white-knuckle ride and it’s along this route that the official Wild Atlantic Way travels. Starting in the Riviera-like Dingle town the R560 road travels in a north-eastern direction snaking up the mountains until the Connor Pass (An Chonair) viewing point is reached. 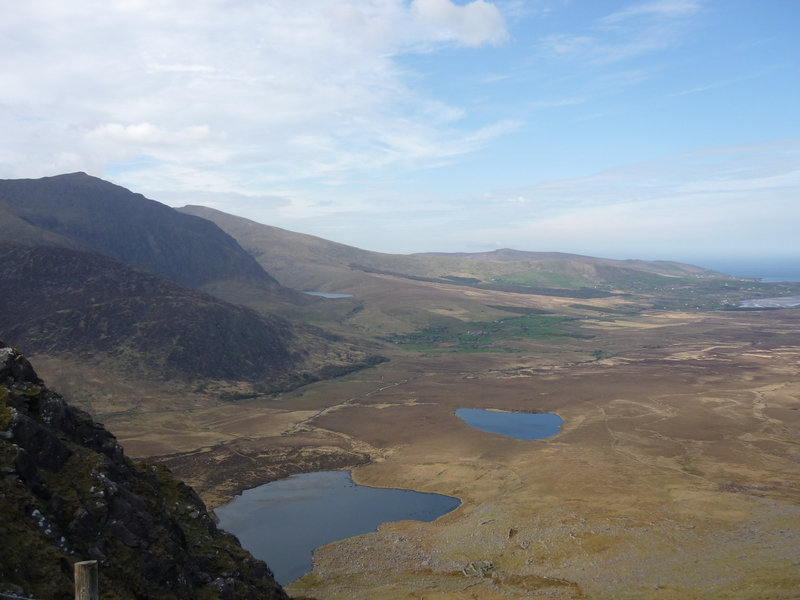 The Connor Pass is one of the highest asphalted mountain passes in Ireland and has spectacular views of Brandon Bay to the north and Dingle Bay to the south. Next up, the white-knuckle ride section of the route. Jagged rocks protrude from the mountains for ascending southbound drivers. There’s a 1,000 feet drop into the above-pictured valley for northbound drivers descending the Pass. 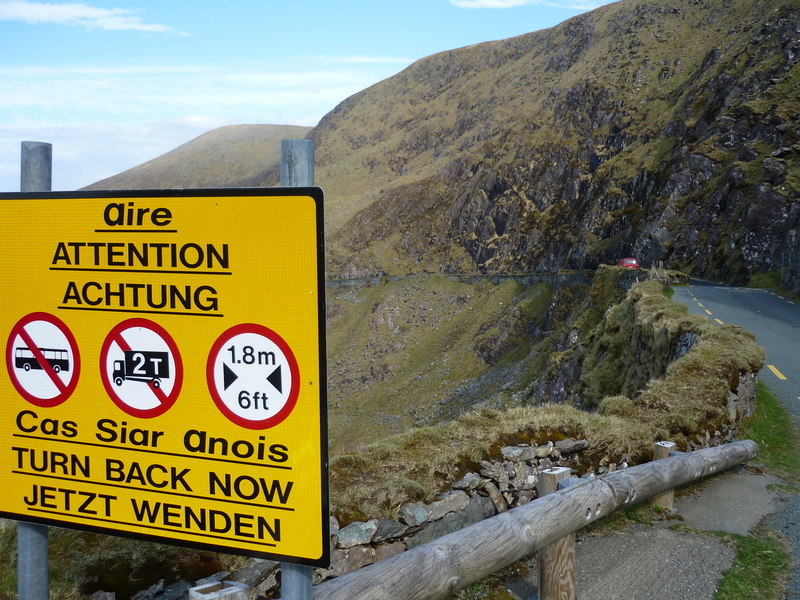 Neither are great options, hence the need for careful driving skills and putting the word Achtung on an Irish road sign! Achtung is the German word for warning. Less adrenaline-releasing options are available by the time the road levels out. 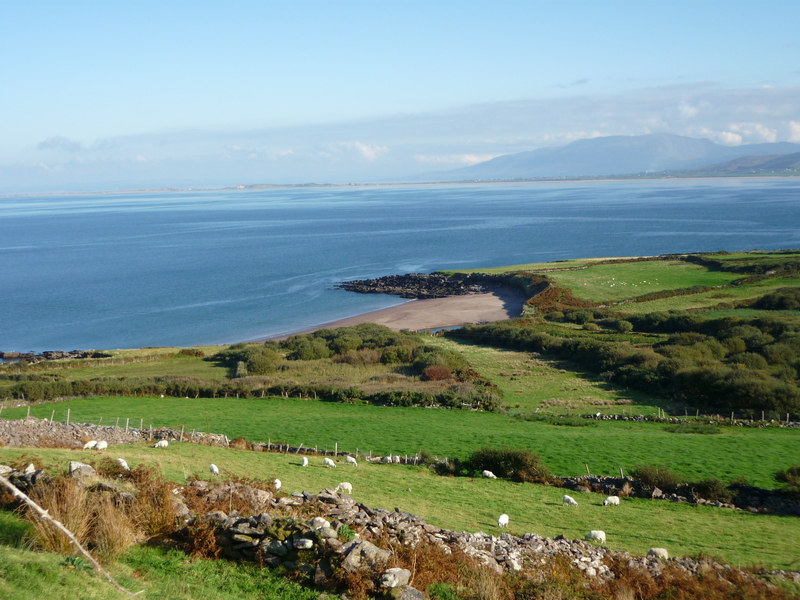 The Wild Atlantic Way splits into two routes, both of which meet in Castlegregory. 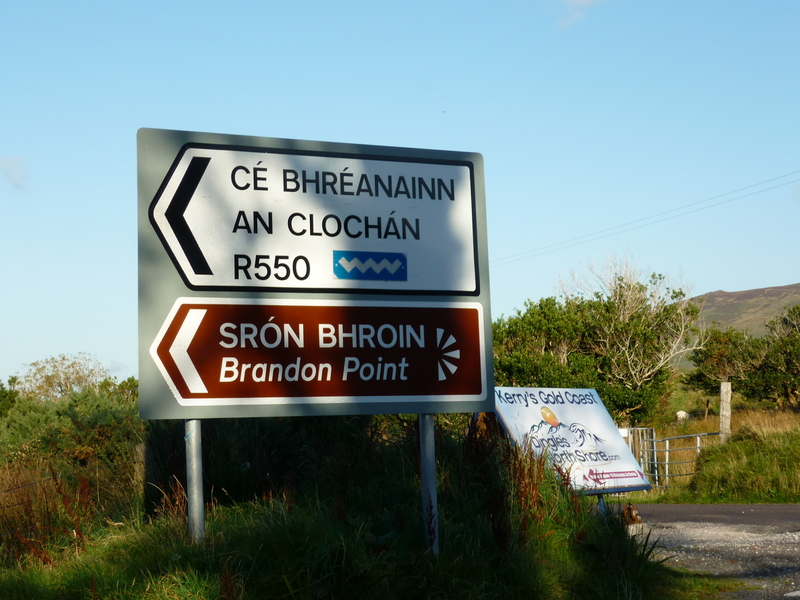 The R560 is an extension of the Connor Pass route but take the R550 road to Brandon (Cé Bhréanainn) and Cloghane (An Clochán) villages to experience one of the lesser-known treasures of Kerry. Hikers may wish to stay overnight in either village as opportunities for climbing abound. For day trippers I highly recommend the walk to Brandon Point from Cloghane (12km approx) or Brandon (5km approx) as much as I recommend the bakery in Siopa an Phobail Bácús Bhréanainn in Cloghane. If accommodation isn’t available in Cloghane or Brandon then Castlegregory, water-sports capital of Kerry, is the next best bet. 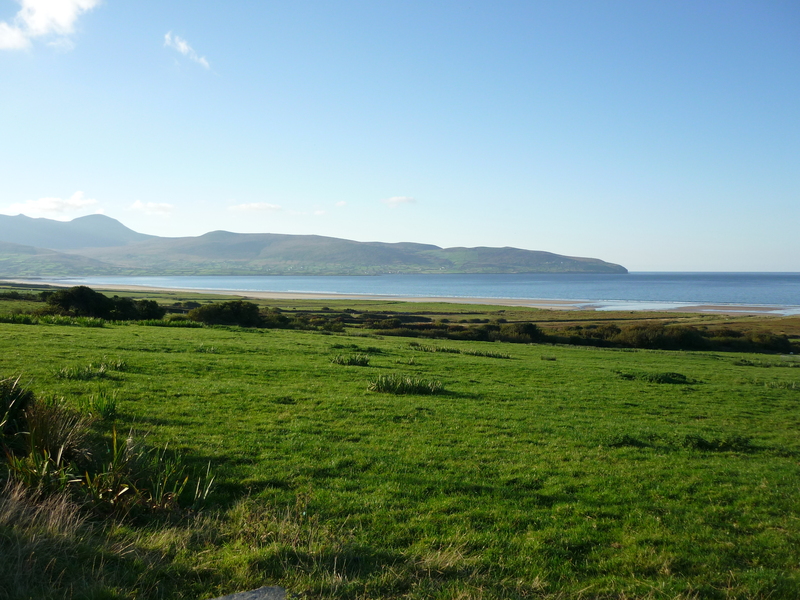 Castlegregory’s expansive beach is one of the most popular beaches in Ireland for surfing as is the Maherees, a sand spit which juts out into Brandon Bay. The Wild Atlantic Way continues eastwards towards Tralee in a straight line with Tralee Bay to the left of the route. 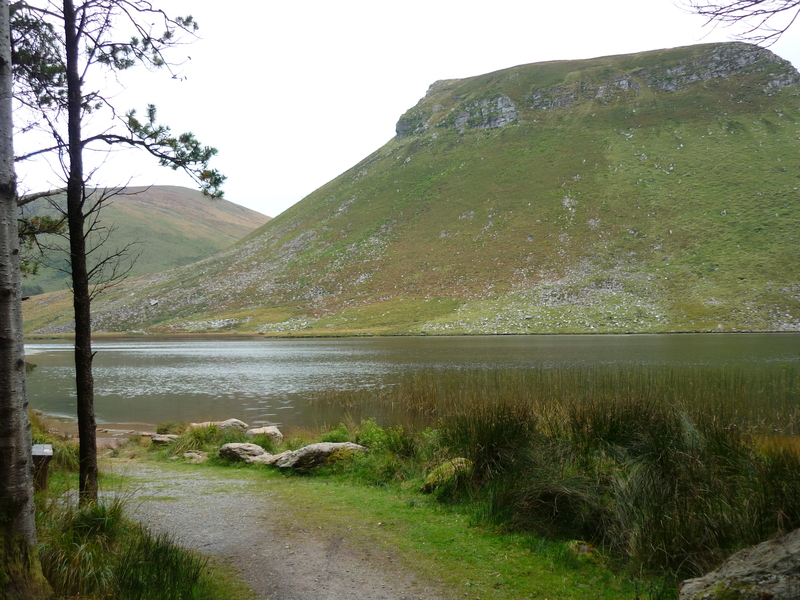 A trek in Glanteenassig Woods, south of Castlegregory, is another recommended walk as are the Sliabh Mish mountains which skirt along the right-hand side of the road into Tralee. Bear in mind that the area around the Knockmichael peak is reserved by the Defence Forces. Glanteenassig Woods. There’s a Nordic Noir feel about the place! The R560 becomes the N86 at Camp village and soon Blennerville’s windmill is visible. A three minute drive from cozy Blennerville along the canal leads into Tralee town and the Dingle to Tralee journey comes to an end. One blog post doesn’t do this varied and inspiring section of the Wild Atlantic Way a great deal of justice so I will re-visit sections in the future. So, see you later…or auf wiedersehen as the Connor Pass folk might say! 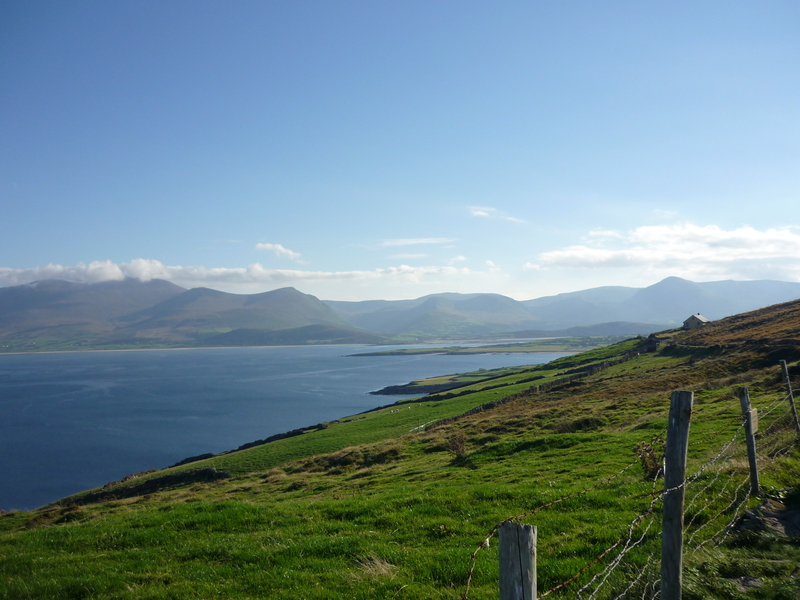 To continue north on the Wild Atlantic Way check out my Great Tour of North Kerry post. For more Kerry destinations check out my Places to Visit in Kerry post. For general travel advice on Kerry have a look at my Kerry, Ireland Travel Guide post and for general travel advice on Ireland check out my Planning a Trip to Ireland post. It is wonderful! My camera doesn’t do it justice.